Sherrr-bourrrrne! For no reason at all, I always pronounce it with an exaggerated French accent, even though its derivation is English — Samuel Ridout named the corresponding street in 1845 after Sherborne, his birthplace in Dorset, England (no one knows why the spelling changed). 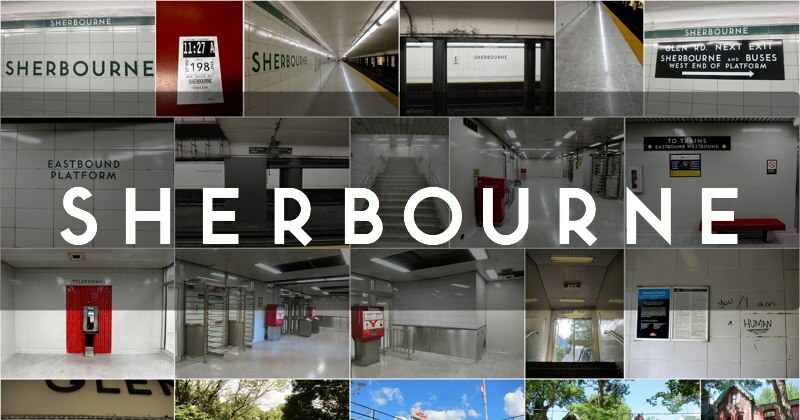 Sherbourne houses the TTC’s Photo I.D. Centre, a processing facility whose usage has waned in the last decade. It used to be that if you were a student, a visit to Sherbourne was the primary way to obtain a photo ID or purchase the next month’s pass. And prior to August 2005, regular Metropass users also had to present a photo-ID, obtained from this centre. Policy and operational changes have reduced the demand for this service. The station doesn’t have an art installation. However, a pair of photographs hang at the main entrance that provide a 'then and now' contrast for the corner of Bloor and Sherbourne. on the left, still standing today. 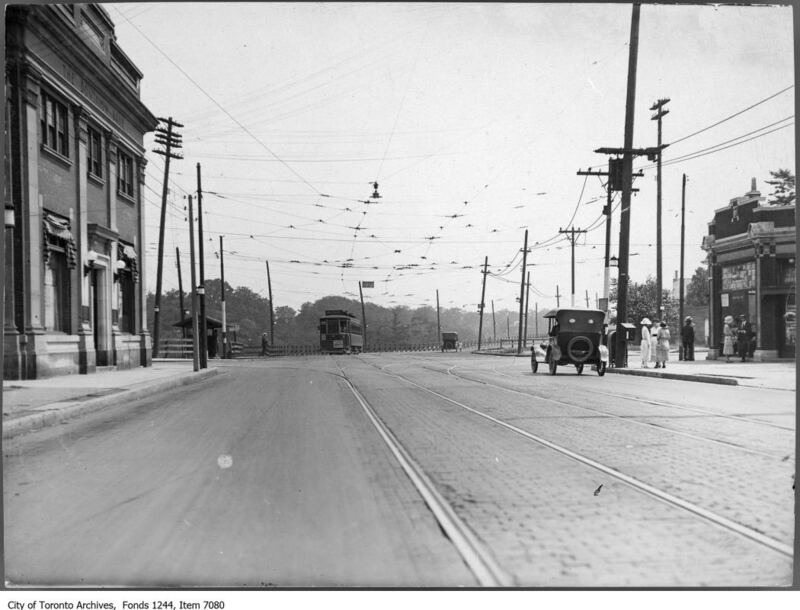 Courtesy City of Toronto Archives. I haven’t much to say about the station itself, which opened in 1966 to serve the St. James Town neighbourhood as well as southern Rosedale. At the eastern end, the exposed mass of piping and wiring in the ceiling gives testament to the hidden organization of the subway. There’s a lot going on, that isn’t necessarily apparent at first glance. If you’re a Torontonian of a certain age, the primary reason you head to Sherbourne is to stumble over to the venerable Phoenix Concert theatre down the street to take in some music. The station’s unmanned Glen Road entrance used to feel quite sketchy in the evening. This was due to the impressive but forlorn row of abandoned townhouses on Glen Road, but that’s changing as those houses are finally being redeveloped. The Glen Road exit also leads to a wonderful footbridge across the Rosedale Valley (don’t get mugged in the tunnel!). The Dominion Bank building on the north west corner of Bloor and Sherbourne was designed by John Lyle, and constructed in 1911.